En español: ¡Bienvenidos a Bloglist24! Bloglist24.com is a FREE database of blogs & websites, built for users and owners of quality blogs or journals. The owners of most read blogs receive great traffic and the end user (visitor) will enjoy reading and commenting on blogs in our directory. Connect with over 167000+ Bloglist24 bloggers and over 1200+ #NordicBloggers (Closed community for Scandinavian premium bloggers & social media influencers – Membership by Special invite only! ), who promote products by creating reviews, galleries & original blog posts! Increase your search engine ranking by having relevant bloggers talk about your brand /business /agency or start-up. Our influencers include Writers, Journalists, Mommy bloggers, Beauty bloggers, Fashion bloggers, Lifestyle bloggers, Art and craft bloggers, Food bloggers, Weigtloss bloggers & many more! You must be the blog’s owner if you wish to register with Bloglist24 (please see our verification process). It is suggested that those in a collaborative or group blog choose one person, generally the owner of the domain or hosting account, to submit their blog to Bloglist24 to prevent duplicate entries. Step #1: Verification process. Please choose and add our widget/button to your page to verify that you are the owner of the blog. Only pages with our widget can appear in our list(s) – Most popular blogs area; in Featured blogs area and can be nominated for “Bloglist24 Blog Awards”. Also Exclusive offers will be sent ONLY for verified users who has been added our badge. Bloglist24 is updated weekly. 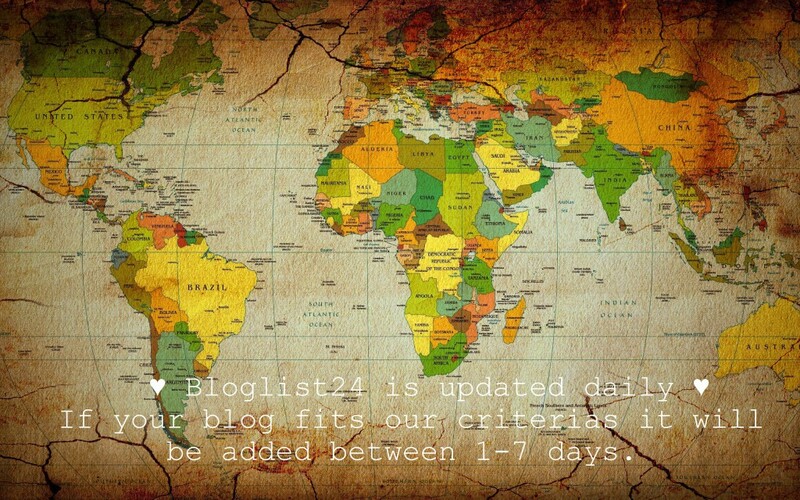 If your blog fits our criterias it will be added between 1-7 days! ATTENTION! Currently the waiting list is 1-2 MONTH!